Our luxury hat clip with removable magnetic ball marker is sure to please any golfer! 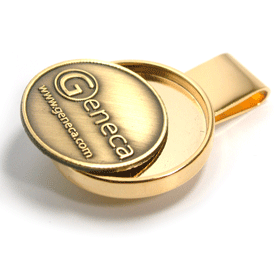 This hat clip with removable ball marker is die struck with your custom design. Pre-Production sample: $50.00(G) plus die charge. Sample charge refundable with order placed. Add 2 weeks to deliver time. Overnight shipping charges apply.